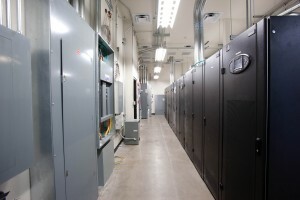 New businesses that are setting up their office requirements often explore the need for mission critical power as part of their facility planning. A reliable supply of power is necessary to maintain smooth operations for the company, and can be especially important for the IT department of the company. As companies plan the specifications for their mission critical power, they need to be aware of the three common failure modes for power outages. First is the direct mode, that is, any equipment that depends on electricity for operation will be down. The second is startup time. Many systems, particularly computer-driven systems, must go through a boot up or other startup routine that can take minutes or hours. Precision machinery is particularly notorious for requiring a significant warm up period. This startup time must be added to the downtime to find the total effect on the company’s operational reliability. The third mode is potential stress and damage due to electrical outages. These are often components that can become damaged or fail if the air conditioning goes out, and allows them to overheat. Obviously, this can cause a significant amount of total downtown as equipment must be repaired or replaced. Companies have two lines of defense as they design their facilities to use mission critical power. The first is power supply reliability, and the second is power supply redundancy. For the former, the reliability of the power supplies for critical components, measured as mean time between failures (MTBF) must be very high. The total MTBF for a system is highly dependent on the reliability of the components most prone to failure. When choosing a power supply, the MTBF should exceed (by at least double) the MTBF of the remainder of the system, in order for it not to be the weak link. By choosing MTBF in this way, a systems engineer can specify the reliability of the computing components, and be sure that the addition of the power supply will not lower the overall system MTBF. The other strategy for a company is redundancy. In order to deal with component failure of an individual power supply, a second supply should be connected in parallel as a backup. The second supply monitors the first, and at any sign of problems, disables the first power supply and turns on its own outputs. At the same time, it will send a signal to the facilities manager to let him know that at least one of the backup systems is online, and that a part of the system no longer has a redundancy, and needs immediate attention. Good design for mission critical power also requires that if the main power grid goes offline, that at least the Tier 3 and Tier 4 IT equipment still have power. This is usually done with an independent generator. This requires significant on-site generation capability. It is only meant to last for the minutes that the main power grid is down. Otherwise, the job of the backup generator is to keep the systems powered long enough for a graceful shutdown. These are some of the considerations for mission critical power for a company. Each business must determine his own requirements for the maximum downtime allowable for his operations, and design his power infrastructure accordingly.